Praised by touring artists nationwide, Michigan Lottery Amphitheatre at Freedom Hill offers the ambiance and intimacy of a fully-immersive live concert experience. Filled with some of the nation’s top touring acts for the 2018 summer concert season, Michigan Lottery Amphitheatre welcomed Post Malone, Slayer, the Beach Boys, 3 Doors Down and much more this past season! We hope you’ll join us next summer for what promises to be another thrilling summer! As a Royal Member, you never have to worry about missing your favorite artists at Michigan Lottery Amphitheatre at Freedom Hill. Even if a show is sold out, you have access to every show in the season lineup! Be among the few who have unique presale access to great events at our other 313 Presents venues, including Little Caesars Arena, DTE Energy Music Theatre, and Meadow Brook Amphitheatre! You never have to worry about parking as a Royal Member. Royal memberships include one VIP parking pass in the lot closest to the venue doors for every two seats purchased. 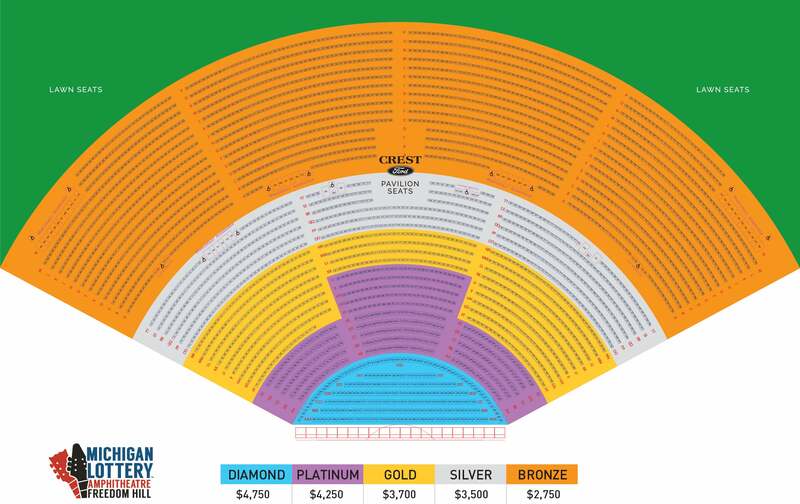 FOR MORE INFORMATION ABOUT A MICHIGAN LOTTERY AMPHITHEATRE AT FREEDOM HILL ROYAL SEASON MEMBERSHIP, PLEASE SUBMIT THE FORM BELOW TO BE CONTACTED BY A 313 PRESENTS REPRESENTATIVE.